Well, having given some thoughts about the comedy side of comedy magic in my last blog, I thought I had better devote a line or two about the magic side. It is obviously just as important as the comedy issue. Speaking for myself, which I am uniquely qualified to do, here is what I think. Performing good Comedy Magic is walking a tightrope. If the show get’s too funny then it tends to throw of the audience reaction to the magic you perform. Therefore what you have to do is to make sure that the magic in your act is really, really strong. Obviously I am not talking about the ‘Cod’ magic acts of giants passed on like Carl Ballentine and Tommy Cooper, they are from a previous era. I’m sure with the cyclic nature of the entertainment business they will return, but now is NOW. Try talking to an agent or TV booker about a ‘Cod’ magic act and they will just look blankly at you. The two people who taught me about the importance of keeping the magic in your Comedy Magic act strong were Ken Brooke and Billy McComb. Pretty darn good teachers. Towards the end of his life Billy became very fond of what he called his ‘Hokum’ act, which was a series of gag tricks and items. I will be honest and say that I really missed some of the classical McComb pieces from earlier years such as his Whisky Egg Bag, Ring on Stick, Coin in Bottle etc. If you are presenting a funny magic show, then the occasional real GASP from the audience is needed to keep you upright and balanced on your tightrope. I am not a great believer in the use of too many ‘Gag’ props or tricks. They tend to smell a little too strongly of mothballs! Worse than that (AHHHH!) they may seem like Vaudeville or Burlesque routines. If you think the use of the expression ‘Cod’ magic scares bookers, buyers and agents; just let them get a hint of the word Vaudevillian and watch them head for the hills! It doesn’t matter how you dress it up with expressions like ‘New-Vaudevillian,’ they won’t bite. Along these lines, there are some tricks that sadly have become a liability to the performer who doesn’t realize that they are quite rightly leading the way on the endangered species list. They might still get a laugh from the audience but that doesn’t matter to ‘The Powers That Be’ and it’s not the audience that can improve your career and increase your prestige and salary. Top of this list is tricks such as the ‘Linking Rings,’ ’20th Century Bra’ and the ‘Bandana routine.’ Up until a few years ago the Bandana/Banana routine was a gem, sadly some idiot released it as a $30 trick and everybody put it into their act. All the performers now use the same tape, the same devils hank and have just devalued the trick as a viable effect. This was a killer routine way back when ‘Allen & Rossi’ were performing it in Vegas in the 60s but it’s day is done now. The real killing is the guy who started selling them for $30! The ‘Baffling Bra’ still gets laughs but is really quite unacceptable in today’s climate. Rather a shame because the props for both tricks weigh nothing and pack flat. I could continue this list but it does more good if you look at your own act with a fresh eye in case it contains one. 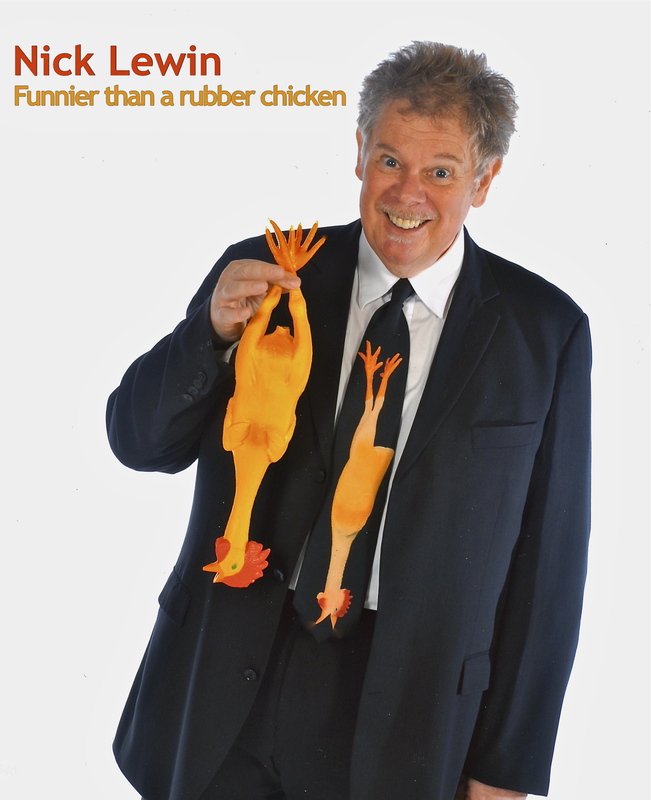 Comedy Magicians rightly or wrongly are considered creaky and unoriginal in today’s marketplace– jugglers even more so, thank God! Now I’m not saying there is anything wrong with performing a classic effect if you bring something fresh to the table. Audiences revere classical musicians, they expect them to perform the classics–otherwise they would just be pianists or violinists. What their audience does expect is a different take on the classics in the way they are interpreted and presented. A classical magician must also think this way if they want to remain relevant. ……or to make my point with a Zen or Haiku (or Twitter) style of brevity, strong comedy+strong magic = strong performer with strong bookings. ~ by Nick Lewin on July 28, 2010. Finney was fantastic! at Richard’s soiree… which you have performed at too! Great to see the old 3 to 1 ropes done by a pro. Card on Forehead if I had not seen it I would not have believed that it could be a closer!